I would rather see the Top Down Movement behavior examples! Please take me there now. The “Top Down Movement” behavior allows the additional functionality of moving an object in either 4 or 8 directions. To add the Top Down behavior to an object, first open the object properties by accessing the object in the object menu or by right clicking on the object in a scene. Select “Edit object” from the popup list. Then select “Behaviors” and click the add behavior button. 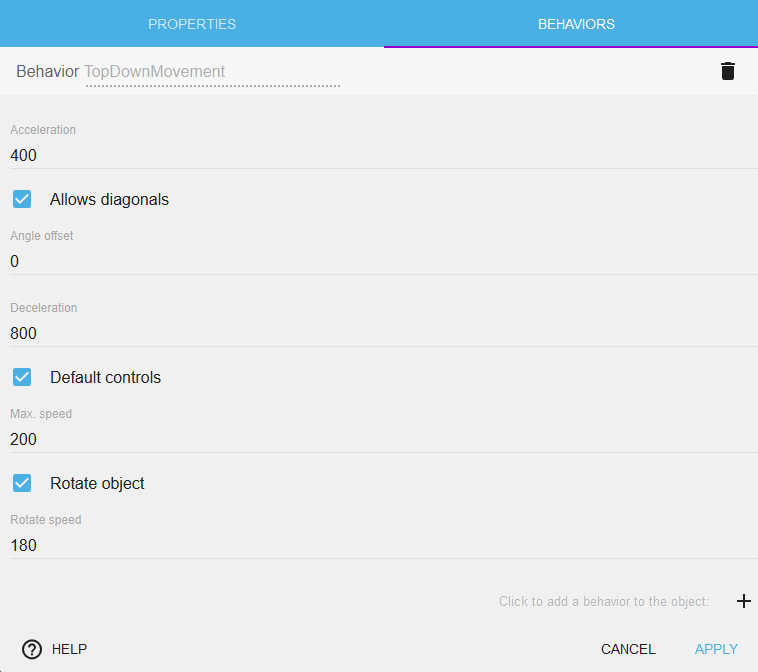 By selecting the Top Down Movement behavior from the list, we add the functionality to our object. By changing the value of Acceleration, Deceleration and Max speed, we can change how fast our object is going to move. By changing the value of Rotation speed, we can change how fast our object is going to rotate or if it going to rotate at all. I'll explain more about rotation below. This option is enabled by default. We allow our object to move diagonally in 8 directions. By disabling this option, we don't allow diagonal movement. When disabled, we can move only in to 4 directions: left, right, up and down. Diagonal movement is no longer allowed. 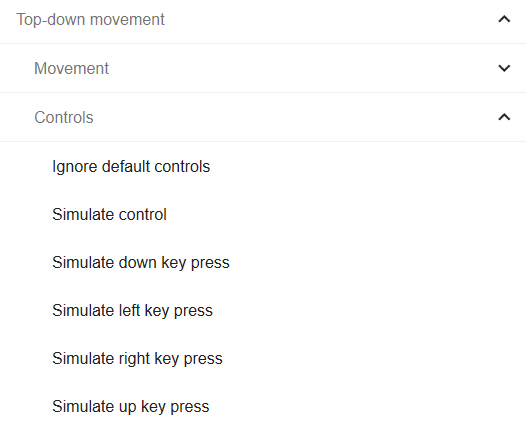 The Top Down Movement behavior comes with default controls enabled. The default controls are the four keyboard arrow keys. If we would like to use custom controls to move the object we need to disable this option by unchecking the box and after we need to use the top down movement events to move the Object. By default our object will rotate toward the direction of movement. The object will rotate at the speed we specify in the Rotation speed option. If we don't want the object to rotate, we need to disable this by unchecking the box. We can also change any of these options by using events found in the “Events” tab section of GDevelop at any time during the game.